An abstract painting inspires color and invites interesting layering to update a business office. 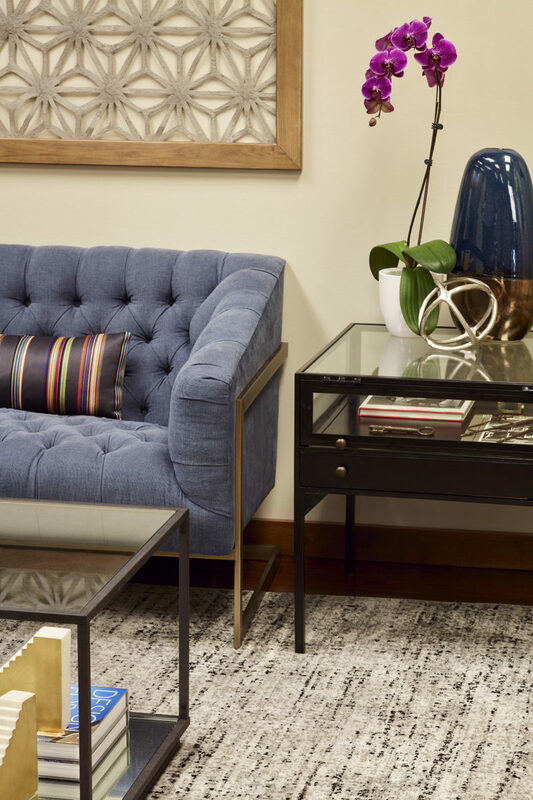 Buttery leather swivel chairs are paired with a slate blue tufted sofa. End tables with jewelry-case tops display antique architectural objects and books to convey company information beautifully. The monochromatic simplicity of the piece above the sofa offers contemporary sophistication. A law firm specializing in real estate and construction had a specific request: to update their reception area to be both contemporary and classic, and include a favorite modern artwork. Inspired by the painting’s bright colors, Peabody’s combines plush velvets and traditional leathers in corresponding shades. Sumptuous tufting and antique furniture contrast with sleek lines and gleaming surfaces and cement the differing styles exquisitely.